The Flatner was a rowing/sailing boat from Somerset, used on the Bristol Channel for fishing and on the rivers, streams and pools of the Somerset Levels. The general shape is flat bottomed and pointy at both ends, which is unusual for the British Isles but widely used in the US and elsewhere in the world. 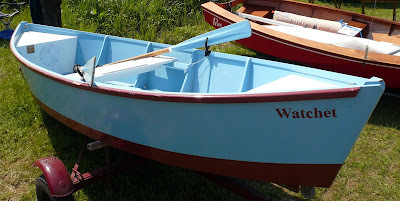 The excellent Watchet Boat Museum, housed in an old railway goods shed in the small Somerset port, has several original flatners and has been promoting the design as an easy-to-make leisure boat. Plans for a reproduction sailing flatner, as built by museum volunteers in 1996, have been available for some time, but now the museum's curator John Nash has built a smaller rowing version and plans are available for that too. 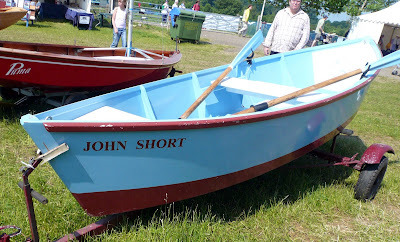 The boat, named John Short after Watchet's most famous character 'Yankee Jack', a sailor who supplied folk song collector Cecil Sharp with more than fifty sea shanties, is 12ft 8in long and weighs less than 2cwt*. The boat was on display at Beale Park, where the pictures were taken. Construction is very simple in plywood and ordinary timber, held together with screws and polyurethane glue. A pair of flotation compartments have been built in fore and aft, a very sensible precaution. John Nash says that it cost him almost exactly £250 to build. The plans cost £25 plus postage - details are here. * Note for Americans: 2cwt = 2 'hundredweight' = 224lb.